If you know me, you know by now that I love Valentine’s Day sweets! 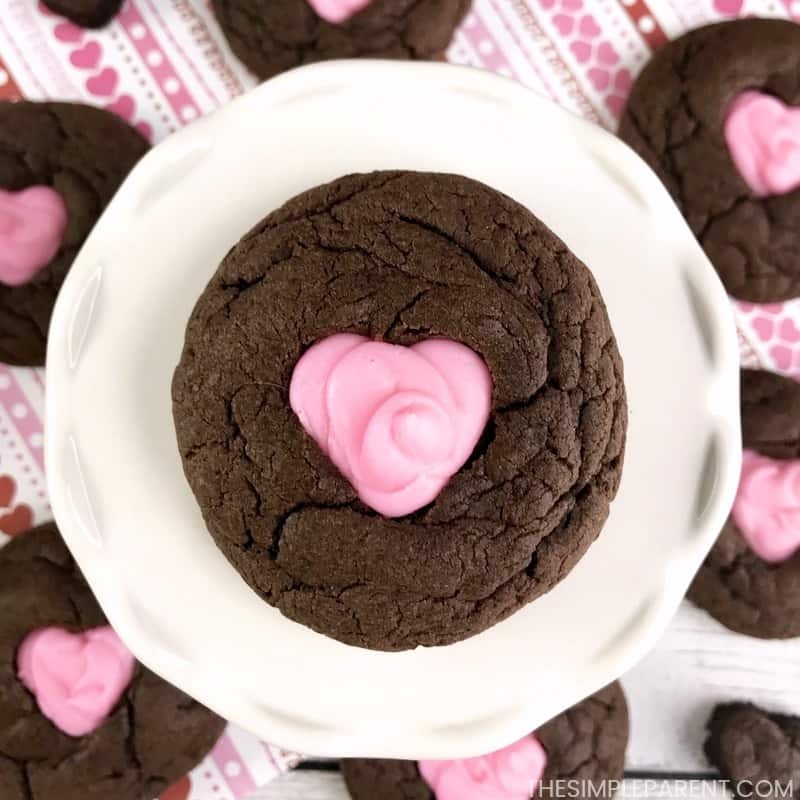 I feel like the reason for Valentine’s Day is love of chocolate, candy, cookies, cupcakes… Okay, so maybe it’s not but this Valentine’s Day Sweetheart Cake Mix Cookie Recipe is one that you will fall in love with. 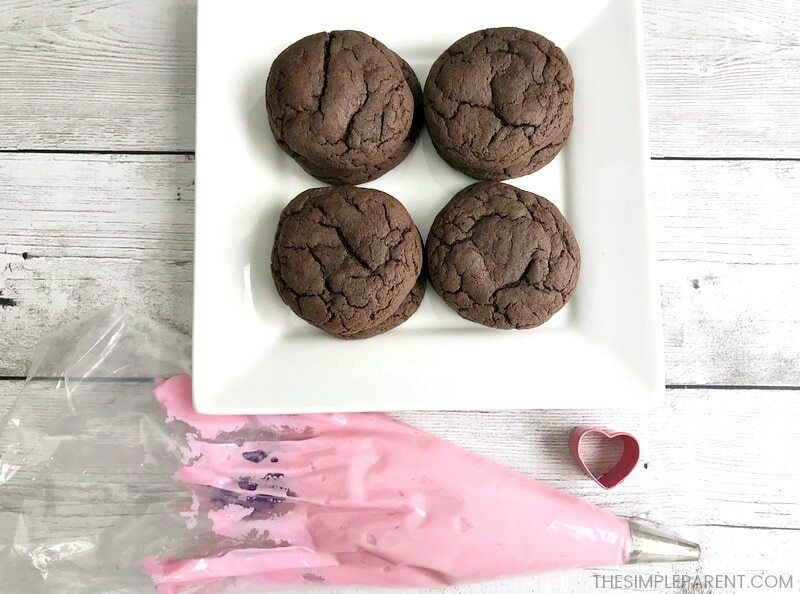 I love most cookie recipes using cake mix (you can check more ways to use cake mix), but this one is just SO easy to make and SO cute, that it’s one of my favorites! Plus, I’m addicted to chocolate cake mix recipes right now! If you’re in a hurry and don’t want to make your own frosting, you can use a can of pre-made frosting from the grocery store. I do recommend that you follow our directions for whipping store bought frosting because it makes for a great consistency that works well with this recipe! 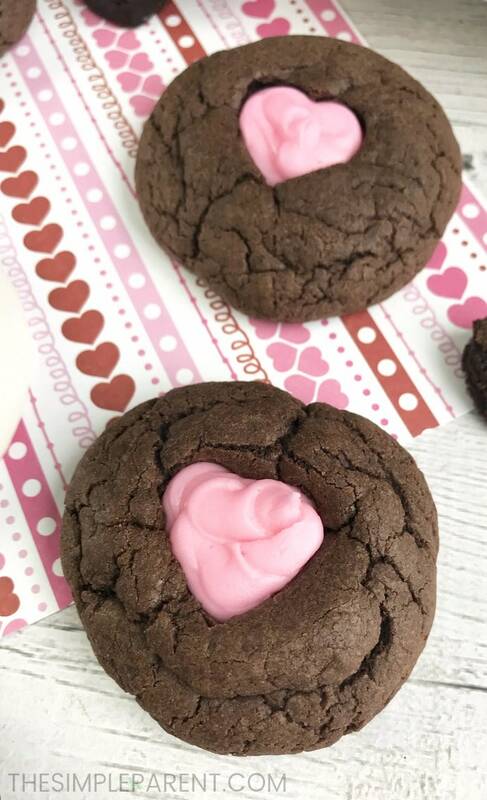 You’ll also need a few other supplies to make these Valentine’s day cake cookies. You can use my affiliate links below to order one so you’re ready to get baking! If you don’t have a disposable frosting bag and tip, you can also use a sandwich bag with a tiny corner clipped off! Combine the cake mix, eggs, flour and vegetable oil. Stir until well mixed. Roll the cookie dough into 2″ balls and place 2″ apart on a baking sheet lined with parchment paper. Combine the powdered sugar, melted butter and vanilla extract. Add milk as needed to get the consistency you want. Add a few drops of pink food coloring. Once you’ve prepared the frosting and you’ve got your cake mix cookie recipe made, you’re ready to put the cookies together! Once the cookies have cooled, use the mini heart cookie cutter to cut out a heart shape. Press the cookie cutter about 1/2-3/4 of the way through the cookie. You don’t want to go all the way through the cookie. Remove the cookie cutter and fill the heart space with frosting. Repeat with each cookie until all of your cookies have frosting filled hearts! 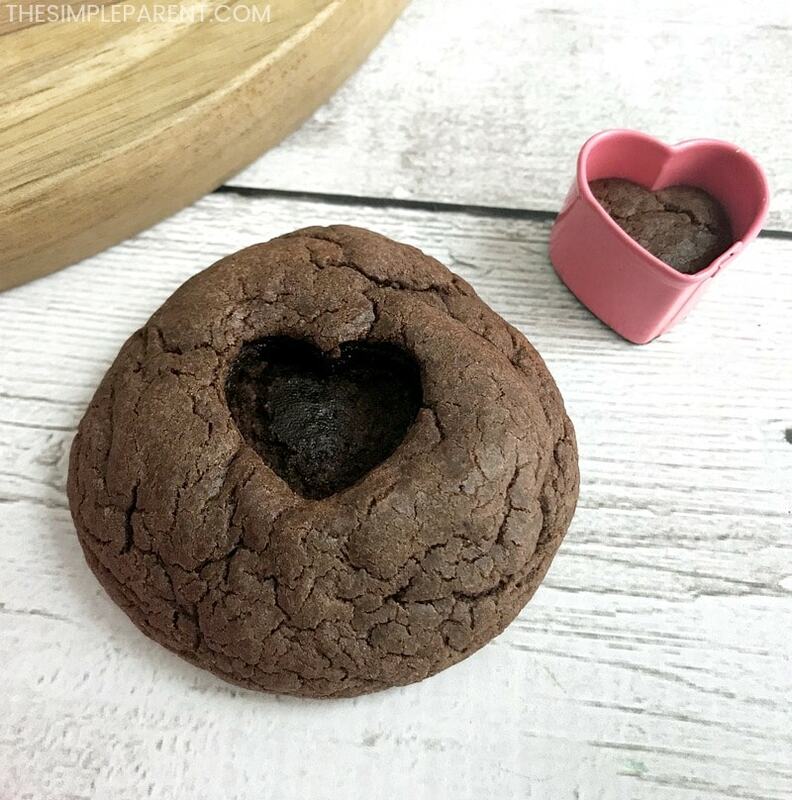 Then you’ll have adorable Sweetheart Chocolate Cake Mix Cookies to enjoy with the people you love! Combine the cake mix, eggs, flour and vegetable oil. Roll the cookie dough into 2″ balls and place 2″ apart on a parchment paper-lined baking sheet. Stir and add the milk as needed to get the desired consistency. Add a few drops of pink food coloring until you get the desired color. 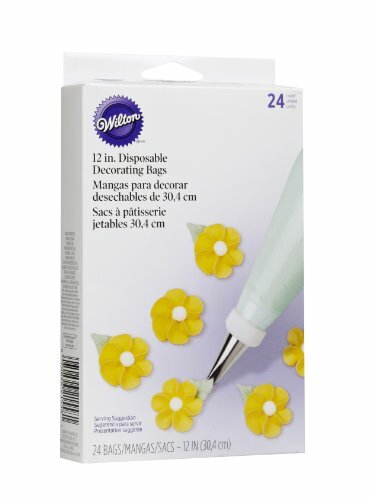 Attach the round frosting tip to a disposable piping bag and fill with frosting. 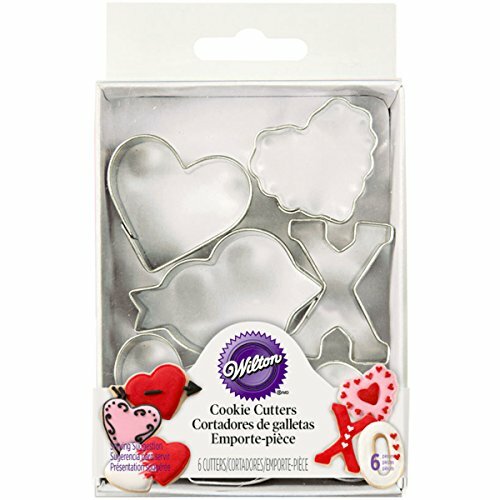 Use the mini heart cookie cutter to cut out a shape in each cooled cookie. Press the cookie cutter about 1/2-3/4 of the way through the cookie. Remove the cookie cutter and fill the heart space with frosting. Repeat with each cookie. This cake mix cookie recipe is easy to make and is great for making with your kids. They can help fill each heart with frosting! It’s a baking project that’s not too messy with results that are super cute! I also love using chocolate cake mix recipes for other holidays! You can make a batch with chocolate cake mix and a batch with white cake mix for some variety. Then just change up the cookie cutter shapes you use and the color of your frosting! Cookie recipes using cake mix are definitely some of the easiest and most versatile! If you’re looking for more ideas, check out all of our Valentine treats! 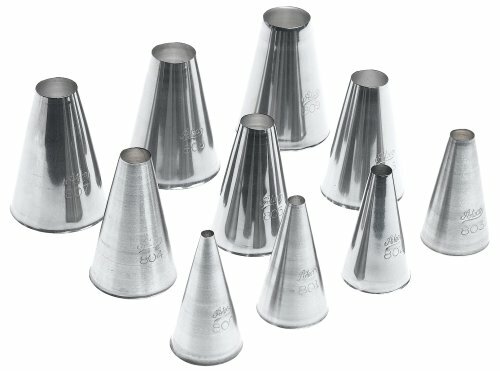 « How Many Cups In a Quart FREE Printable for Easy Math!